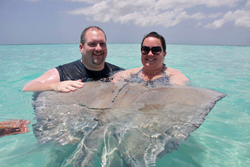 Cruise Planners franchise owner Lori Osgood, right, of Jacksonville, Fla. is pictured with her husband Richard Osgood at Stingray City in Grand Cayman, Cayman Islands. During the past 3 years, Cruise Planners has seen a 66% increase in franchisees under 40 joining the growing network. Cruise Planners, an American Express Travel representative, is the nation’s largest network of home-based travel agents who customize and plan a variety of vacations for all types of travelers. As a profession, travel agents are making a resurgence with the number of travelers using a travel agent reaching an six year high in 2016 according to MMGY Global’s Portrait of the American Traveler. One factor could be Millennials are traveling the world more and are the age group most likely to use travel agents. Also, anyone who has started a travel search online knows how overwhelming it can be to experience information overload during an internet search. Because booking travel without support can be overwhelming, travel agents show their value by offering professional guidance, the best value offers and insider information for booking a vacation. Osgood is one of more than 1,800 Cruise Planners franchise owners who enjoys the benefits of working from home while selling vacations. As a franchise owner she is able to operate her independent franchise, while being her own boss, one of the many career perks important to young professionals. By focusing on industry relationships, she was able to propel her business and credits the growth of her franchise to the Cruise Planners training program and ongoing business development support she receives. As a budding entrepreneur, she regularly collaborates with other franchise owners in her area and proactively reaches out to the travel partners to create opportunities to network and learn from each other. Osgood works closely with her business development training coach and has set goals for the coming year as she continues to push past personal milestones in her travel career. As a relatively young travel agent she specializes in family vacations, honeymoons, destination weddings and more. Headquartered in Coral Springs, Fla. with more than 22 years of experience, Cruise Planners has achieved top producer status with every major cruise line. Accolades include numerous Magellan Awards from Travel Weekly, American Express Travel Representative Excellence Award for 13 consecutive years (2004-2016), American Express Agency of the Year (2010), Royal Caribbean International Chairman’s Award (2015), Royal Caribbean International President’s Award for Overall Achievement (2012 and 2014), Royal Caribbean International Home-Based Partner of the Year (2007-2013), Norwegian Cruise Line Elite Agency of the Year (2016), Norwegian Cruise Line Franchise Agency of the Year (2011-2015), Celebrity Cruises Home-Based Partner of the Year (2016), Celebrity Cruises Field Sales Account of the Year (2015), Celebrity Cruises Home-Based Account of the Year (2013-2014) and Celebrity Cruises Southeast Region Travel Agent Partner of the Year (2010), Travel Impressions Best of the Best Globe Award (2008-2016), Sandals Top Host – Worldwide, Globus Family of Brands Premier Agency Partner (2009-2016), Platinum Circle Member with Viking River Cruises (2009-2016), Uniworld Boutique River Cruise Collection Top Producer (2008-2016) and Regent Seven Seas Cruises Top Producer. Cruise Planners is one of the Top 50 franchises for Veterans according to GI magazine, the Top Franchise Brand for Veterans according to Franchise Business Review, has been named one of the Top 25 franchises for African-Americans by Black Enterprise magazine and is a member of the International Gay & Lesbian Travel Association. For more information, visit http://www.cruiseplanners.com.